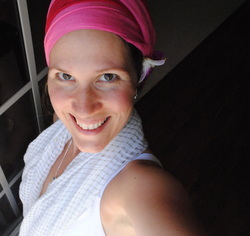 I'm Kara Elaine Barr (Omkara Ma), free spirit, lover of life, yogini. I found my way to Yoga after the birth of my daughter in 2003 during what I now refer to as a "dark night of the soul". Chanting and kirtan and meeting the "hugging saint" Sri Mata Amritanadamayi literally saved my life. I had no desire to be a teacher back then, it just unfolded. I had been practicing Yoga for many years, and then completed my RYT 200 yoga teacher training in classical Raja Yoga through the Shiva Dancing School in Raleigh NC. Even though my 200 hr training was in Raja yoga, I would call myself a Bhakti yogini at heart which means "the yoga of devotion." I aim to share compassion, loving kindness, and peace through my practice. Because my background is in attending birth, nursing, and caring for mothers and babies, it was natural for me to go on to prenatal yoga training as an RPYT in Prenatal/Postnatal Yoga. It is my absolute joy and passion to teach prenatal, postnatal, and mom and baby yoga, as well as other styles that have a more gentle approach. I've always had a longing for re-union with this "something" I now call my highest Self, and it's inspired me to deepen my practice so I can better support and guide others along the journey. In essence, Yoga is UNION. It's LOVING YOURSELF as you are. It's about knowing yourself and being true to yourself. Self- Realization. Listening to your own inner voice. Developing your intuition and trusting it. It's a transformative process, a journey. It is a discovery of who you really are, and letting go and surrender of all that you are not.